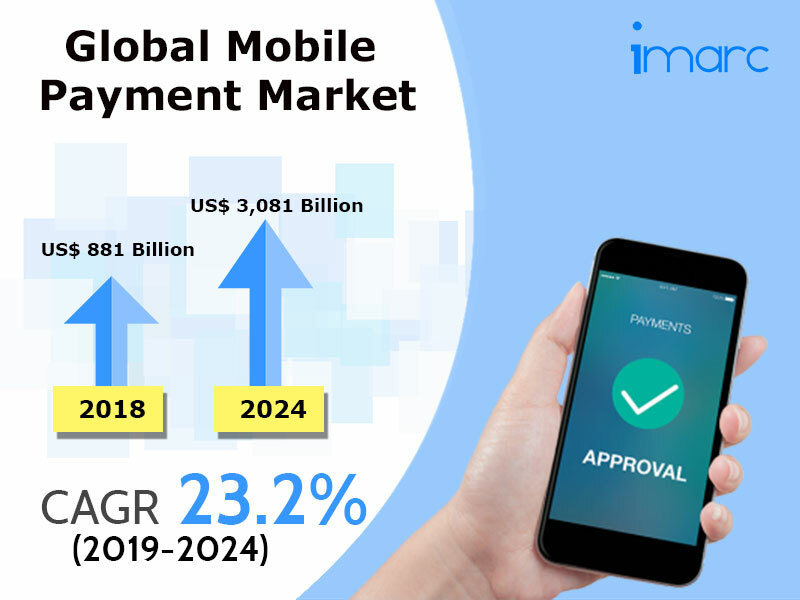 IMARC Group’s latest market research report, titled “Mobile Payment Market: Global Industry Trends, Share, Size, Growth, Opportunity and Forecast 2019-2024”, finds that the global mobile payment market reached a value of US$ 881 Billion in 2018. Mobile payment, also known as m-payment, refers to an e-payment method which utilizes mobile devices to authorize, initiate and confirm an exchange of money. These payments are facilitated by the availability of point-of-sale (POS) terminals that process transactions using nearfield communications. Nowadays, mobile payments are gaining popularity as they offer enhanced security features and convenience to users. Moreover, the growing penetration of smartphones and easy access to the internet have encouraged tech-savvy consumers to prefer mobile-based payments. Besides this, many payment networks are collaborating with mobile operators to provide advanced mobile payment solutions, especially in emerging markets. Nowadays, many vendors are offering special discount coupons on m-commerce platforms to attract a broader consumer base. Various banks and companies are also providing mobile payment options in their apps to enable immediate transactions from the consumers’ bank accounts. Apart from this, non-bank entities have also introduced pre-payment instruments (PPI) which help in conducting interpersonal transactions. Additionally, several leading companies have recently developed applications, such as Google Pay and Apple Pay, that allow payments by scanning a unique barcode or QR code displayed on the screen of a smartphone. Moreover, governments of various nations are taking initiatives to promote digital payments which are anticipated to create opportunities in the mobile payment market. Looking forward, the market value is projected to exceed US$ 3,081 Billion by 2024, expanding at a CAGR of 23.2% during the forecast period (2019-2024). Based on the mode of transaction, the market has been segmented into WAP (Wireless Application Protocol), NFC (Near field communications), SMS (Short Message Service), USSD (Unstructured Supplementary Service Data) and others. Amongst these, SMS (Short Message Service) represents the most popular mode of transaction. On the basis of the application, retail is the largest segment, accounting for the majority of the market share. Other major segments include entertainment, energy and utilities, healthcare, hospitality and transportation, and others. Region-wise, Asia Pacific enjoys the leading position in the global mobile payment market. Asia Pacific is followed by North America, Europe, Middle East and Africa, and Latin America. The competitive landscape of the market has also been examined with some of the key players being FIS, Gemalto, MasterCard, PayPal, Alipay, Visa, Apple, Google, Samsung Electronics, Bharti Airtel, American Express, Bank of America, Citrus Payment Solutions, LevelUp, MobiKwiK, One97 Communication, Orange, Oxigen, Square, Venmo and ZipCash Card Services.